Focus Dailies Toric are daily contact lenses designed to correct astigmatism. 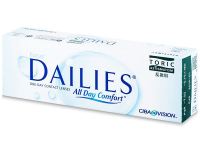 Their advanced technology ensures smooth edges, thus reducing friction and increasing comfort. 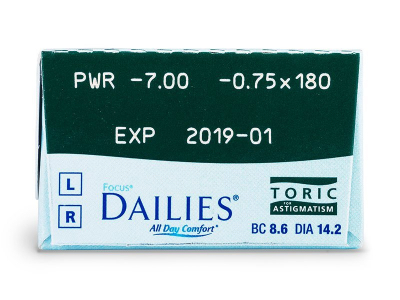 Focus Dailies Toric are available in packages of 30 or 90 lenses. 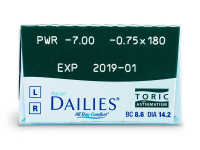 Focus Dailies Toric by Alcon are daily disposable lenses for users with astigmatism. Their high water content (69 %) and high oxygen permeability together ensure outstanding comfort throughout the day. This package contains 30 lenses. 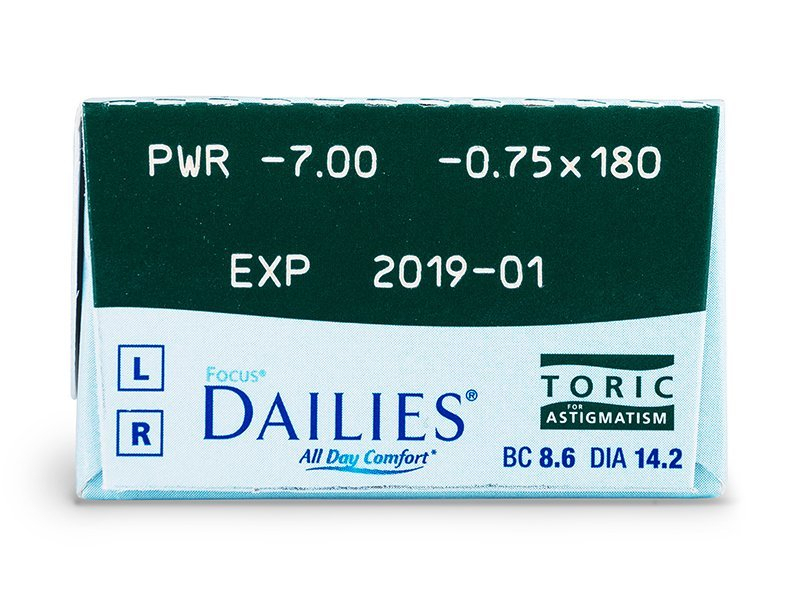 Focus Dailies Toric are also available in a package of 90 lenses. 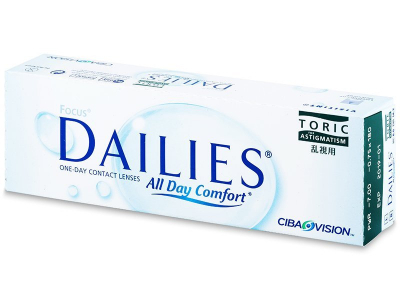 These lenses are comparable to Dailies AquaComfort Plus toric lenses, which are also available in a package of 30 lenses. Focus Dailies lenses are made from biocompatible polyvinyl alcohol material, which has been developed especially for daily contacts. Their unique LightstreamTM Technology ensures smooth edges that reduce irritation caused by friction when blinking. Generally can't go wrong with Dailies lenses. Always feel great on the eye and actually last for most of the day without drying out. 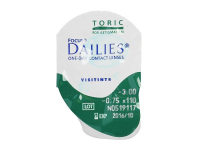 Hi there, do you have these Focus dailies toric next day delivery? Was hoping to get them before the weekend. Hi Sarah, we don't have next-day delivery, but our DHL service guarantees delivery within 1 to 2 business days. 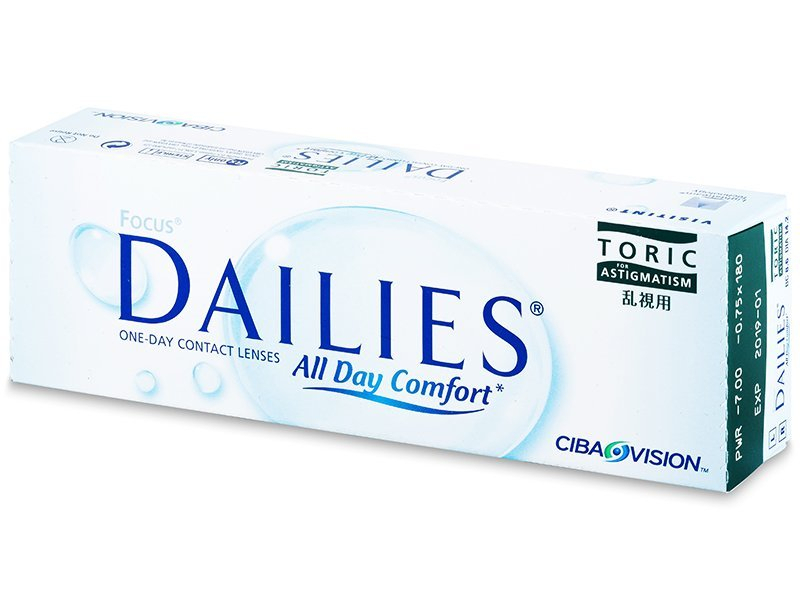 Very soft lenses - they make wearing them all day a pleasure. Please contact our customer support should you have any further questions! It's absolutely crazy that these are being discontinued. Why?! They are great lenses, and the 'replacement' does not cover my specification so I am back to wearing glasses again. Quality of life= blah. Thank you very much for your comment, unfortunately the decision to discontinue this line of lenses is out of our control. We hope we are able to provide you with lenses that meet your specifications in the future.